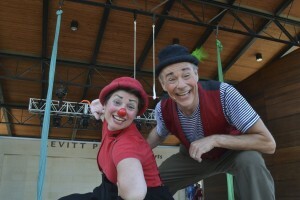 Family favorite The Lone Star Circus return to Levitt Pavilion Arlington. Levitt Pavilion Arlington’s 2014 season kicks off with a Memorial Day weekend packed with music, featuring wildly popular Austin-based songwriter Bob Schneider (May 23) and blues legend and three-time GRAMMY-winner Jimmie Vaughan (May 24). GRAMMY-winner Rick Trevino (June 14), up-and-comers Jamestown Revival (July 6), family favorite The Lone Star Circus (July 9) and much more fill up the Summer Series, which closes with upbeat Cajun blues courtesy of GRAMMY-nominee Tab Benoit (July 13). But the music’s not done yet—stay tuned to Levitt Arlington on Facebook and Twitter for announcements on the exciting fall season. 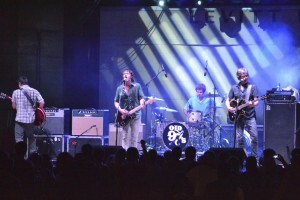 The Old 97’s at Levitt Pavilion Arlington. The group will play the Levitt Shell this summer. Another exciting season begins Memorial Day weekend at Levitt Shell Memphis! Opening day of the Summer Series at the Shell brings us an all-star, orchestral performance of beloved Memphis band Big Star’s album Third/Sister Lovers (May 23). The free music in Overton Park continues with GRAMMY-winner Rosanne Cash (June 14), blues group The Cedric Burnside Project (June 21), singer-songwriter Cory Chisel’s Soul Obscura (July 12) and more, closing out on July 20 with alt-country pioneers the Old 97’s. And make sure to follow the Levitt Shell on Facebook and Twitter—that’s where you’ll hear first about details on the Fall Series. 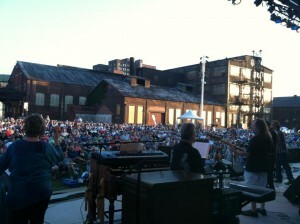 A packed house for local bluesman Craig Thatcher at Levitt SteelStacks in 2013. Thatcher returns to the stage this summer. The 2014 season at Levitt Pavilion SteelStacks starts with a preview weekend on May 16 featuring indie rockers Our Griffins and Americana act Beaucoup Revue and concludes September 13 with an all-out dance party with Brother Joscephus & the Love Revival Revolution Orchestra. Power pop rockers The Smithereens (May 24), GRAMMY-nominated Latin fusion band Locos por Juana (July 3), local bluesman Craig Thatcher (July 12), classic rock group Vanilla Fudge (September 12) and more fill up the 50+ evenings of free music. 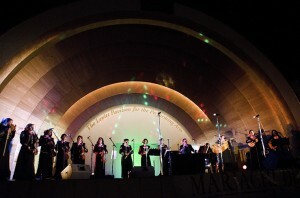 Mariachi Divas performing in 2013 at Levitt Pavilion Pasadena. They return to the Pasadena stage and Levitt Pavilion Los Angeles in 2014. Levitt Pavilion Los Angeles’ 2014 series kicks off with a bang on June 8 when LA’s own Ozomatli take to the stage! The free music in MacArthur Park continues, with GRAMMY-winning Mariachi Divas (June 14), electronic duo Peaking Lights (July 3), British folk legend Richard Thompson (July 10), kids shows like Birdie’s Playhouse (August 24) and more filling summer days and night with tunes. The season wraps up at the end of August, with Latin Ska artist La Resistencia (August 28) and GRAMMY-winning Latin genre-benders Quetzal (August 29) closing out a summer that promises to be the best yet! 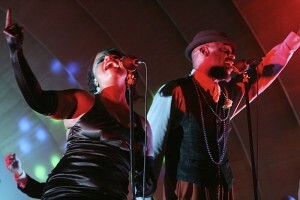 Vaud & the Villains perform at Levitt Pavilion Pasadena. 2014 marks the 12th season of free, live music at Levitt Pasadena! Summer kicks off June 15 with jazz legend Barbara Morrison, closing on August 23 with up-and-coming songwriter John Fullbright. Alt-Latin band Pistolera (June 28), cabaret jazz revivalists Vaud & the Villains (July 5), family-friendly, bilingual Latin GRAMMY winners Lucky Diaz and the Family Jam Band (July 9), the Omega String Quartet (August 22) and many more round out the eclectic and amazing season! 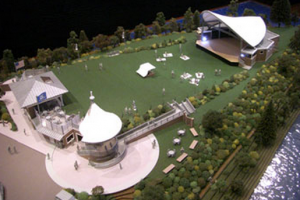 A beautiful new pavilion for Levitt Westport is slated to open in mid-July. Levitt Pavilion Westport is currently building its new state-of-the-art venue, slated to open in mid-July. They’ve already been busy planning a fun summer season, with Incendio, Vince Giordano & The Nighhawks, DJ Rekha and more scheduled to perform. Make sure to stay tuned to Levitt Westport’s season page for updates!